FTC disclaimer: This post contains affiliate links. I received a copy of this book for review purposes, but all opinions are my own. 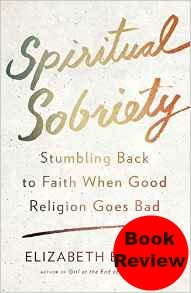 When I was offered the opportunity to review Spiritual Sobriety: Stumbling Bak to Faith When Good Religion Goes Bad by Elizabeth Esther, I was excited. I reviewed her book Girl at the Edge of the World when it was released, and I was looking forward to reading her second book. While her first book was more of a memoir, Spiritual Sobriety is the book I have been waiting -- and longing -- for someone to write. As someone who has experienced a myriad of religious practices, I know that something, somewhere along the way had gotten lost in some of the churches I had been to. Life was a religious roller coaster for me. If the Sunday evening service wasn't emotional, I almost felt cheated. There were mission trips, prayer meetings, retreats, and other "mountaintop experiences". I even remember a song from the 1980s that I loved that said, 'Next time I'm bring back a piece of the mountaintop." Religious highs were common. But with the highs come the lows and along with those more spiritually dry times comes the thinking that you are not as "right" with God. And then there is the feeling of needing to do more. Which is legalism because nothing you can do will make God love you more (or less) than He already does. Elizabeth Esther gives guidance as to how to overcome religious addiction in this book. This is a sorely needed volume in the world because there are so many who have become addicted to religion. Learning to rest in God is something that took me years to be able to do, because shouldn't we instead be performing good works? In the same way, she refers to how religious fervor can cause burnout. I can remember going to a church that had church nightly. I just couldn't make it to all those services, it was just too much. I had been going for a while before the church got a new pastor and he made those changes. After I stopped going to that church, it was a couple years before I could go back to church because I was just so worn out from all the demands put on us. When I read a great book, I often read it very quickly and then go back and and take in everything I didn't absorb. This is one of those books. I want to work through it chapter by chapter. It would make a great book for a recovery group or individually to help shed the guilt and pick up the grace.